To discover more new French voices, including Maryam Madjidi, the 2017 winner of the Prix Goncourt for a first novel, click over to our Fall 2017 issue. 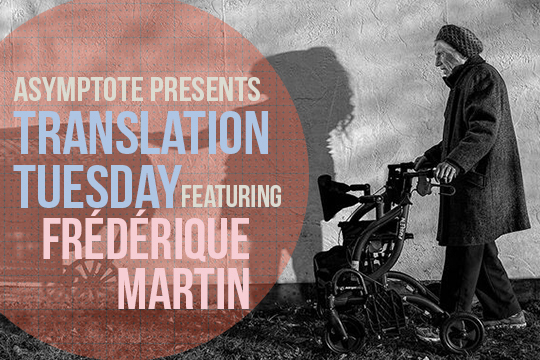 Frédérique Martin is a French novelist, short story writer, and poet. She writes for adults and children and has won several awards for her work, including the Prix Prométhée de la nouvelle for L’écharde du silence in 2004. Her latest collection, J’envisage de te vendre (j’y pense de plus en plus) (I’m Considering Selling You (I’ve Been Thinking About It More And More)), published by Belfond, was shortlisted for Prix Place aux Nouvelles 2017. ‘The Despair of the Roses’ is the first story in this collection. Frédérique is a member of writers’ associations including SGDL and CRL Midi-Pyrénées and is a jury member for the Crous de Toulouse short story prize. She teaches creative writing, and reads regularly in schools and libraries. She has adapted some of her work for stage and film. In her latest artistic collaboration with director Ouahide Dibane, she plays two roles and does the voiceover for the short film of “The Despair of the Roses.” Further information can be found here. Hilary McGrath is a writer and literary translator. Born in Ireland, she has lived in France for fifteen years. She holds a B.A. in Applied Languages and an M.A. in Creative Writing. Her translation of Yolaine Maillet’s poetry has appeared in Spontaneity. Her own short stories have appeared in journals such as Words with JAM, Crannóg, The Incubator Journal, and The Ofi Press. She won the Writing West Midlands Short Fiction Competition 2013, and was listed in Writers & Artists, and Fish. She also compiled and edited the Gascony Writers Anthology 2016.